If you caught our TETRIS! post a couple of weeks ago, you’ll know that the seventh row of the periodic table is officially complete and that earlier this month the International Union of Pure and Applied Chemistry disclosed recommended names for the four elements discovered most recently. Identified by atomic number, which gives the number of protons in an atom, the new elements are 113, 115, 117, and 118. Like several other elements, these four were created and discovered in a lab. In fact, heavy elements—those with atomic number 93 or greater—are not very stable. Many exist for only fractions of a second before decaying and are not usually found naturally on Earth. Although they don’t have real world applications—at least not yet—the newest elements and those next in line to be discovered are exciting case studies of quantum mechanics and the special theory of relativity. Evidence shows that heavy elements don’t always act like our best models predict that they will, and exploring how and why is at the very frontiers of science. Some scientists have suggested that certain “superheavy” elements could be more stable than the current trend suggests, which would be a fascinating discovery. Even if direct applications are lacking, studying these elements will certainly help us better understand the laws of the universe. In a series of systematic computer simulations, scientists at the University of Tsukuba in Japan have gained insight that could help scientists create element 120, possibly the heaviest element we can discover with current technology. Their results were published last month in Physical Review C.
A proposed template for an extended periodic table. If discovered, element 120 would be the second element in the 8th row. Scientists have been trying to synthesize element 120 since 2006, but with no luck so far. One of the superheavy elements, element 120 is expected to be stable for only microseconds before decaying. Scientists are attempting to create the new element by fusing, or merging together, the nuclei of two different atoms. In a nutshell, they do this by shooting a beam of one kind of nuclei at a target of another kind. 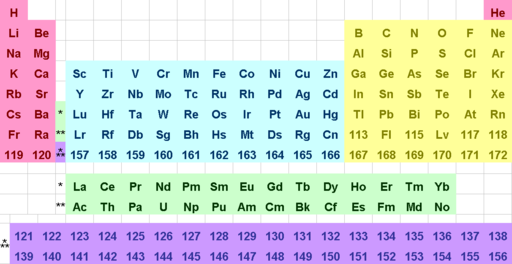 Since element 120 needs 120 protons, you need to fuse two nuclei whose protons add up to 120, such as plutonium and iron (elements 94 and 26) or uranium and nickel (elements 92 and 28). As part of his PhD work, Kazuyuki Sekizawa and his thesis advisor Kazuhiro Yabana were exploring how well existing theory describes what happens when two heavy nuclei collide. In particular, they were looking at cases when protons and neutrons are transferred from one nucleus to the other during a gentle collision. Sekizawa developed a computer program for numerical simulations based on a particular theory rooted in quantum mechanics. The theory has been around for a long time, but hasn’t been applied in this way before. Once the simulation was up and running, they started by looking at what happens when different kinds of nuclei collide gently, and then moved to more violent collisions. At this point, Sekizawa and Yabana realized that the two colliding nuclei were behaving in an interesting way—after colliding, the nuclei partially merged before splitting apart. It turns out that the results of their simulation are comparable to what scientists have found experimentally. Sekizawa designed the computer program so that you can systematically change variables related to the collision, like the energy at which the nuclei collide. In this way, he and his advisor were able to identify how certain factors affect the outcome of a collision. By tweaking these factors, they were able to predict the ideal conditions for producing superheavy elements like element 120. Other scientists have collected a lot of experimental data on what happens when you collide the nuclei of certain forms of nickel and uranium (for any chemists/physicists in the group, this refers to the reaction 64Ni+238U). So far they have come up short of creating element 120, but results from this simulation suggest that they shouldn’t give up just yet. The simulation suggests that by colliding the nuclei at a certain orientation and at higher energies than past experiments have tried, there is a possibility of synthesizing element 120. Sekizawa wasn’t in search of a way to create element 120 when the project started. “I just had a curiosity to see what happens in the simulation,” he says. Curiosity can be a powerful motivator for exploring the unknown, as with the quest to create and study new elements. And the reality is that new understanding often leads to applications that we could never have predicted anyway.